Ideal for bedwetting and incontinence. No need to change the entire bed. 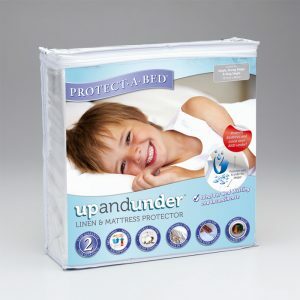 The Up and Under Linen & Mattress Protector is designed to keep your mattress, sheets and quilt dry, hygienic and stain free. 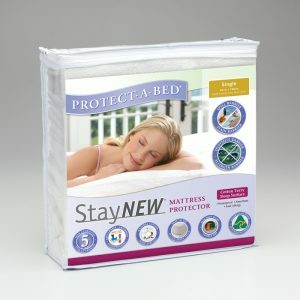 The tuck-in drawsheet style protector is comfortable, absorbent and quiet, with a unique waterproof yet breathable top sheet. It features adjustable size press studs for flexible application for children and adults in mind and is quick and easy to fit and remove. For optimum convenience, use with full mattress and pillow protectors. You can find out more information on all of our bed wetting products and incontinence products here. 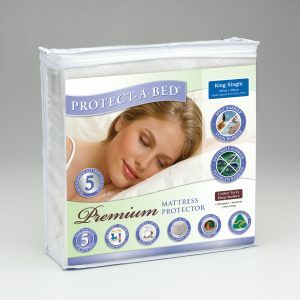 If you are looking to protect your bed with confidence, the Protect a Bed Premium Mattress Protector is the ultimate product on the market, offering maximum absorbency protection and comfort. The waterproof absorbency of the Protect a Bed Premium Mattress Protector can handle even large spills or stains, while the ultra-soft cotton terry towelling provides a comfortable, soft sleep surface. The ultra-thin four way stretch does not detract from your existing mattress comfort, while the Expandall® skirt fits all standard and extra depth mattress sizes. You can find out more information on all of our bed wetting products and incontinence products here. This highly waterproof and absorbent mattress protector will keep your mattress clean and dry with its 100% waterproof Miracle Membrane protective layer. This fitted sheet style mattress protector provides protection from bedwetting and spills, as well as allergens, dust mites and stains. The ultra-thin four way stretch does not detract from your existing mattress comfort, while the Expandall® skirt fits all standard and extra depth mattress sizes. You can find out more information on all of our bed wetting products and incontinence products here. 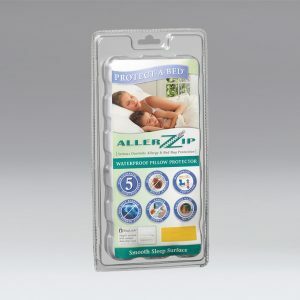 Keep your pillows protected from accidents with the AllerZip Pillow Protector. The highly waterproof Miracle Membrane barrier protects your pillows from stains and fluids and keeps it lasting fresher for longer. This ultra-soft pillow protector also provides complete comfort from bed bugs, dust mites and allergens with its BugLock® zipper system and dust mite flap, making it suitable for asthma or allergy sufferers. You can find out more information on all of our bed wetting products and incontinence products here.